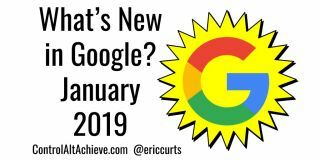 Below is the recorded video from our January 2019 Google User Meeting, along with the meeting agenda and all the awesome resources and G Suite updates from the last month. This includes 23 new Google updates and 27 Google resources for your class. You can view the full Google Document agenda with links to all the Google Apps updatesfrom the last month, as well as all the resources covered in the meeting in the Google Doc linked below.